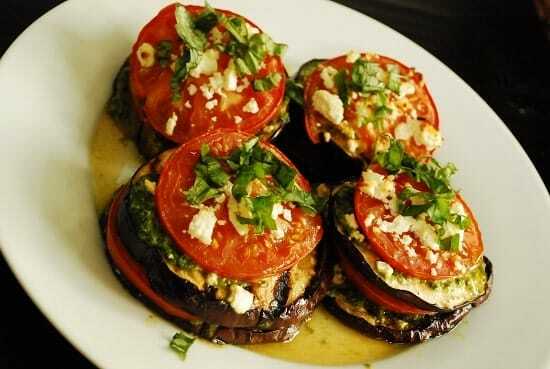 This incredibly tasty Grilled Eggplant with Tomatoes and Feta Recipe is as lovely to look at as it is to eat. Just 3 Points per serving makes it a perfect Weight Watchers Vegetarian Recipe idea. I served it as a low calorie side dish with some roasted chicken, and it complemented the meat perfectly. It’s so fresh and flavorful, and is a great idea for a summer recipe to serve a t a dinner party or potluck. I wasn’t a fan of eggplant recipes until I traveled to Israel and tried a few eggplant dishes there. I am so glad I did! Now I adore eggplant and am always on the lookout for delicious new Weight Watchers Eggplant Recipes to try. They are delicious and FULL of fiber, so they can definitely help to bulk up a dish. But this lovely and simple grilled eggplant recipe was perfect as is, and will definitely be something I’ll be making again. A beautiful, delicious and healthy vegetable side dish recipe, this Grilled Eggplant with Tomatoes and Feta is a real treat. It makes a great vegetarian lunch or dinner, or goes well paired with some roasted chicken or grilled steak. Lightly mist each slice with an olive oil mister and grill them on a grill rack that’s been lightly sprayed with non-stick cooking spray for about 2-3 minutes each side. Finely chop the basil leaves, and combine with olive oil, lemon juice, garlic and salt & pepper. Cut the tomatoes to 1/4” thick rounds. Spray a small baking sheet with non-stick cooking spray and preheat oven to 400 degrees. Arrange 4 eggplant rounds side by side. Spread about 1/2 tablespoon of the basil-garlic mixture on top of each one, then sprinkle feta crumbs. Top each with tomato rings. Add another layer of eggplant, basil spread, feta and tomato rounds and top with the rest of the crumbled feta. Love this recipe and presentation. Just pinned and tweeted it..
Yum! I think I’ll have to try this one when my garden tomatoes get ripe! One way I like using eggplant is to bulk out lamb dishes, making a little bit of that flavorful-but-fatty meat stretch a long way. I brown lamb cubes, then add cubed eggplant, mushrooms, and tinned tomatoes, along with some Moroccan seasonings, and then cover and let it simmer until everything melds and melts together. Serve it over whole-wheat couscous for preference. That sounds DELICIOUS!!! Thanks for sharing!